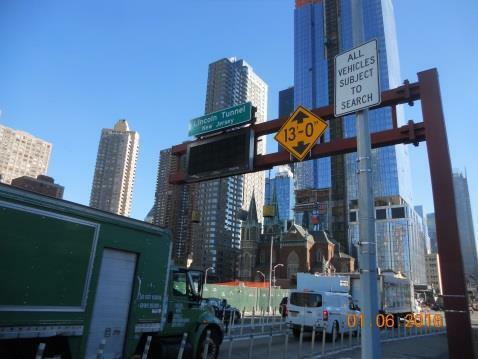 AEA is providing engineering design support services to prepare the Stage I design documents necessary for planning the construction improvements to the existing Lincoln Tunnel facility Overheight Vehicle Detection System (OVDS). Based on a concept developed by the Port Authority which was selected for advancement to design, this project will help to minimize the number of over height vehicle crashes at the North Tube entrance by determining the design requirements and preliminary construction cost estimate necessary to further advance and implement improvements to increase system reliability, utilize modern technology, and decrease response time. AEA has performed an evaluation of the latest existing technologies for overheight detection and provided recommendations for a proposed system. All recommendations include the electronic design, cost implications, civil design, and structural design. Coordination with existing field conditions and traffic patterns is being performed to ensure that the overall utilization of the area is not negatively affected. Design meetings with the Port Authority are being held to discuss the design and findings of the reports.